As another lengthy cold winter has begun to remove her grip, many of us are thinking of the spring that lies ahead. Springtime in Michigan is a season for melting snow, watching flowers grow, and terrific walleye fishing. Normally during this time anglers gather from all across the region to jig for this freshwater delicacy in the Detroit River. These fisherman use traditional ball jigs tipped with minnows, combined with the popular method of back-trolling to entice these spawning fish. At times the fishing here can be very productive, but the almost constant snags and nearly impenetrable boat traffic can make fishing very cumbersome. Over the last several years a new method of walleye jigging has been developed, which offers terrific fishing without dealing with the heavy boat traffic and expense of losing jigs. Not only that, but the fishing grounds are only a few minutes drive away from the Detroit River, on nearby Lake Erie. 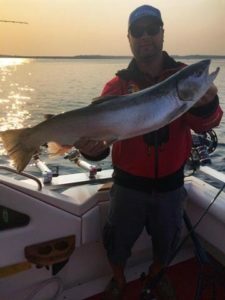 This new kind of jigging has been used by fisherman and Charter Captains in Ohio for several years but has been slow to catch on here in the great state of Michigan. But due to its great success in recent years it can’t remain secret any longer, and once you master this technique you will never dream of fishing the river the again. Once you have stocked up on hair jigs, you must familiarize yourself with the technique before you venture out onto the water. This technique is only effective during the walleye’s spawning season, which typically runs from late March through early May. During this time Lake Erie walleye spawn in nearby rivers, open water reefs, and in the shallow flats near shore. This method is best used on the fish that are spawning in the open waters located on the reefs and in the shallows. During this time the walleye’s spawning grounds are loaded with aggressive males that are patrolling the area protecting their nests where eggs have already been laid and also the future nests. These fish generally are not feeding, but attacking any intruders that may harm their unborn offspring. Because of this, a very aggressive type of ‘horizontal’ jigging is usually the best bet. Start by casting out on the downwind side of boat while you are adrift. There is no need to back troll in this situation, because staying vertical is not necessary with this presentation. Once you’ve casted your jig, let it fall to the bottom and aggressively jig it back toward the boat. Remember that you are not feeding the fish; you are aggravating them and causing them to strike out of anger and aggression rather than hunger. Therefore being too aggressive is usually not an issue. Continue on with the pattern right up until the jig ends up under the boat and give a few extra jerks before retrieving it and casting again. If you find that you are not having luck with this presentation, add a minnow to the main hook on the jig and it may increase your success rate. On most days minnows are not necessary but it is a good idea to take a few dozen shiners with you just in case the fishing is slow. For this technique I prefer a medium-heavy action rod spooled with no-stretch braided line such are Berkley Fireline. The combination of a stiff action and ‘no stretch line’ gives great sensitivity along with very quick, powerful hook sets. Braided line may be more expensive, but in applications such as this it is well worth it. The best time of the year for this type of fishing is generally in the peak of the spawning season, which is usually in the last few weeks of April. Hotspots in recent years have been the shallows from Bolles Harbor to the Maumee River, the reef complexes near Port Clinton, the Turtle Island area and virtually anywhere that there is structure and shallow water that will hold spawning fish. Although it has been kept secret for several years, this type of jigging flat out puts fish in the boat. 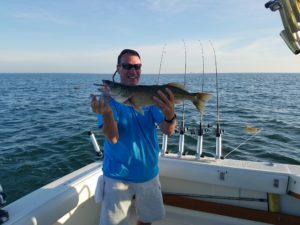 Whether you take your own boat, tag along with a friend, or charter a boat, this is a great way to spend a day on the water this spring…..don’t miss out on the best keep secret on Lake Erie!! !